China Stories: 10 Examples of Fast Food in Other Countries: Anybody ever heard of a Double Prosperity Burger? 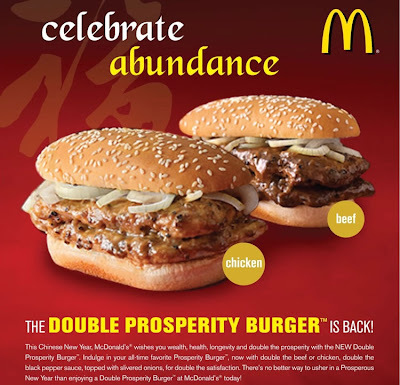 10 Examples of Fast Food in Other Countries: Anybody ever heard of a Double Prosperity Burger? -This is not an ad for Mickey D's I swear. 2. Double Prosperity Burger: This is either two chicken breasts (not breaded or fried) or two beef patties in an oval shape served on a hoagie type bun. They are dripping in a pepper sauce and have raw onions on the top. Their big push was to eat this in Malaysia during the Chinese New Year. There are tons more Fast Foods from Other Countries.